The Hammer Crosstech XTR Programmable Cross Trainer is a piece of exercise equipment that was made to suit all workout enthusiasts, no matter their level of fitness. It comes with a 16 kilogram magnetic flywheel, a choice of moving or stationary handlebars, non-slip footplates, and an LCD display for all the necessary data readings. The machine is fairly easy to assemble, as you just need to follow the instructions manual, and you’ll have it ready for use in no time. One of the key features of the Hammer Crosstech XTR Programmable Cross Trainer is that it comes with 16 different built-in workout programs that will make it easier for use for those who have never worked out on an elliptical before. 12 of the profiles adjust the load and the other 4 respond to the pulse sensors and automatically adjust to ensure your heart rate stays in the optimal range. This really helps to boost the efficiency on your workouts and burn those extra calories. On top of that, you can also choose from 16 different magnetic resistance levels. In other words, you will have the opportunity to choose different levels of resistance and gradually start doing more challenging workouts at your own pace. 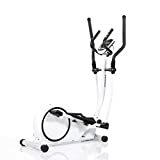 The heavy flywheel that weighs at 16 kilograms and a 3-piece crank make this machine one of the best cross trainers on the market, since they guarantee that you will experience ultimate smoothness when you’re doing your workout. Having a heavy flywheel also helps to generate extra resistnace, it produces enough to challenge a moderate user however, if you are an athelete you may want to get a slightly more challenging model such as Nordic track E7.2. A great thing about the Hammer Crosstech XTR is that it allows you to do both forward and reverse motions of the foot pedals, adding an extra dimension to your workouts. When it comes to this piece of exercise equipment, you can choose between 2 different movable and 2 stationary handlebars. The stationary handlebars help measure your heart rate accurately while working out, since they have pulse sensors on the hand grips. On the other hand, the movable ones will help you exercise better and help you focus on your upper body muscle groups more. Despite weighing 38 kilograms, you can easily transport the machine wherever you want thanks to the transport wheels that are built into the front stabilizer. 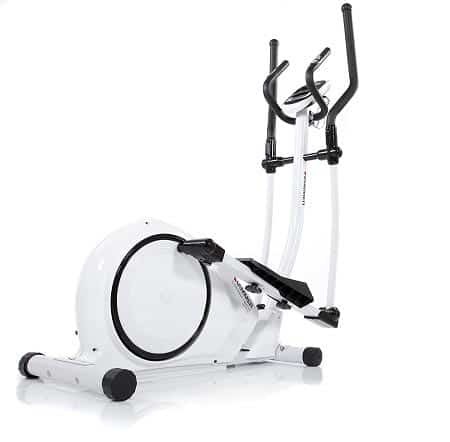 One of the main advantages of this piece of exercise equipment is its extremely high comfort level as well as the rather heavy flywheel that ensures a smooth workout. The Hammer Crosstech XTR Programmable Cross Trainer comes with pretty large foot plates that are separated by a distance of 21cm, which means that there is no way that your feet will collide or that they will make noises or tap on the ground. The efficiency of this exercise machine is pretty high, considering that you will have different resistance levels and built-in workout programs to choose from. With that being said, you will be able to focus on certain muscle groups that you want to work on, rather than just going for the standard full body workout. 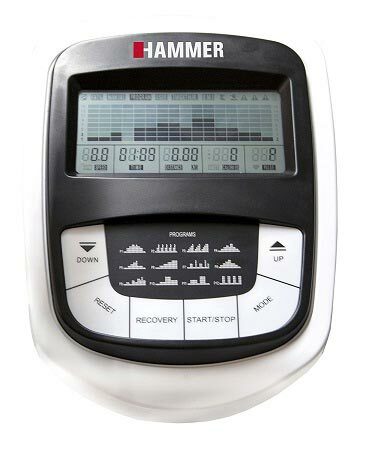 The build quality of the Hammer Crosstech XTR Programmable Cross Trainer is excellent. The heavy gauge steel that is used to make this product is very strong. In other words, this exercise machine is noted for its great durability. It is clear that this model was set to the high engineering standards set in Germany where it is manufactured. The maximum user weight for this piece of equipment is 130 kilograms, while the machine itself is 38 kilograms. This model isn’t the cheapest on the market but you get what you pay for when it comes to exercise equipment. You will also have peace of mind thanks to the 2 year warranty on all parts which is very rare amongst most exercise equipment manufacturers. This shows the confidence that Hammer Fitness have in their equipment. If you’re looking for a simple machine that you can use to exercise daily, then you shouldn’t look any further. Perfect for beginners/ moderate users, people with lower body injuries, and those who haven’t exercised in a while, the Hammer Crosstech XTR Programmable Cross Trainer is a machine that will certainly get you back in shape. This piece of exercise equipment is perfect for people who can’t handle jogging or running. It is also great for people suffering from lower body injuries. However, it’s not just people with injuries who choose to use this exercise machine. It’s the top pick among people who simply don’t like the treadmill put still want to do their cardio. Cardio exercises are one of the best ways to burn calories, so if you’re looking to shed a few extra pounds, an exercise machine like the Hammer Crosstech XTR Programmable Cross Trainer will surely help you reach your goals. There are a lot of reasons why you should give cross trainers a try. One of the best reasons to use this machine is because it will help you train your whole body. Unlike a lot of other exercise machines that target a specific part of the body, the elliptical will provide you with a full-body workout. The moving handlebars on the Hammer Crosstech XTR will allow you to work you arms, chest, back, and shoulders all while simultaneously exercising your legs. This also means that you will have the option to choose which part of your body you will put focus on during your next workout. When using a cross trainer, you will also have the option of working your whole body or focus on specific muscle groups.